Baseball is a game of inches. Often agonizing. 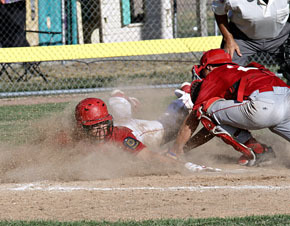 Such was the case for Albion Cornerstone Legion Baseball last Wednesday in the championship round of the 2012 American Legion Juniors Area B-5 Tournament at the Albion Sports Complex Legion Field. With two outs in the bottom of the seventh inning, Aurora’s Scott Burgmark lofted a fly ball to right field that dropped just inches inside the foul line, allowing teammate Eli Becker to race home from second base with the winning run in a 5-4 decision. Albion, which needed to defeat Aurora twice Wednesday night, entered that final inning with a 4-3 lead and left with the loss and runner-up B-5 finish that concluded a terrific 23-7 season. Cornerstone reached the championship round by defeating Wayne 10-3 Tuesday, their second B-5 victory over Wayne in a three day span. Albion could not quite overcome top-seeded Aurora, however, dropping two games to the tourney champs by a cumulative score of 9-6 (4-2, 5-4).